But I'm here to give love to another tree that is merry and bright - ginkgo trees! I honestly don't even remember seeing them growing up in the Midwest. We were blessed with all the maples and oaks; I guess I didn't miss the beauty of the ginkgo. During autumn in New York, these trees truly are merry and bright. Their golden fan-shaped leaves are like little smiles littering the streets and beaming from the trees. There is an incredible photo essay going around online about a famous ginkgo tree in China that showers its leaves over a little temple. I saw the article last week and it has stayed with me as I walk the NYC streets enjoying the leaves above and below me this season. We don't have to live in China, nor do we have to be in a formal temple to have a sacred experience. I've always treated the world around me as my church. Deities and religious statues are incredibly powerful reminders to pray, worship, whatever; but most of my conversations with God happen underneath the trees, the sun, the clouds, etc. And in my kitchen! For years this stunning picture of a ginkgo leaf has graced my living room. It brings me grace, peace and ease with its simplicity. Do you know the history of these trees? They are living fossils, with the earliest leaf fossils dating from 270 million years ago. A ginkgo can live up to 3,000 years. Amazing. They have high tolerance for the elements and even air pollution. In fact, they thrive! 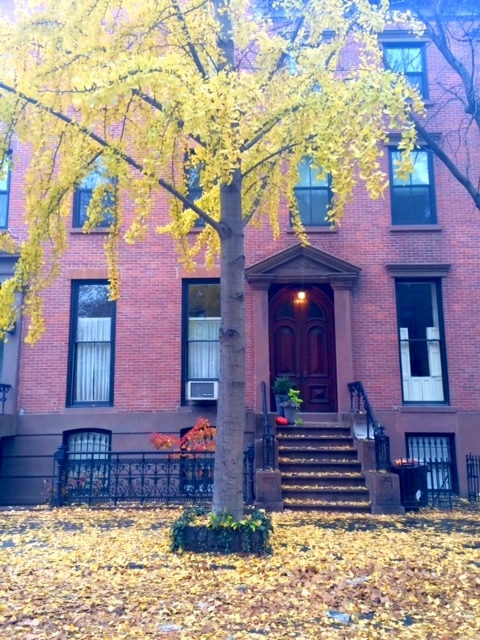 My Christmas tree is up, as stunning as ever, but this year I’m going to take notes from the ginkgo. I will keep close the reminder that the whole world surrounding me is sacred. No matter the elements I encounter, be it grumpiness, gossip, cold weather, or the global pollution of tragedy and terrorism, I will do my best to thrive and be merry and bright during this holiday season. Cheers! Don’t worry… I’m not going to give you a recipe using ginkgo nuts (which I hear are quite stinky and if eaten in excess can cause poisoning.) One of my favorite holiday treats as a kid was a nut from a tree that comes from Ohio - the buckeye! Okay, so real buckeyes are poisonous too, but you can’t go wrong with these chocolate and peanut butter candy stand-ins. In a large bowl, mix together the peanut butter, butter, vanilla and confectioners' sugar. The dough will look dry. Roll into 1 inch balls and place on a waxed paper-lined cookie sheet. Reserve one teaspoon of dough. Remove toothpicks and fill the holes with reserved dough.